Inon Zur has scored a lot of videogames over the years, including Fallout 3, Fallout: New Vegas, and—I didn't expect this one—Fallout Tactics. No great surprise then that he's doing the soundtrack for Fallout 4, which he said on Bethesda.net will be different from his previous Fallout scores because this game "is a very personal story." The piano will feature prominently this time around, although in a somewhat modified form. "I have a very nice grand piano at home, and I recorded myself playing the main theme," Zur said. Game Director Todd Howard thought the sound was "too bright, bordering on harsh," so Zur came up with a combination of a real piano and an electric piano, a sound he said "is really round and not bright at all but very lush." "So following that lead on, there are multiple times that I use this," he said. "You also hear it first in the main theme. This is not a mistake or just a random choice. The piano will stay with us throughout the whole score." 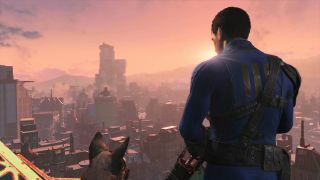 The Fallout 4 "soundscape" will consist of three major elements—classical instruments, electronic instruments, and non-musical/primitive instruments—which Zur hopes will combine to give gamers a sense of location when they play. "For example, in some parts of the game we decided that the right feel would be more orchestral, but the lead instrument is low accordion," he said. "Other areas, I sampled myself playing this unusual improvised ocarina, which gives all this airiness and shrillness." The Fallout 4 theme on the piano sounds great; a second track, The Last Mariner, is far more ambient but still a gorgeous piece. The Inkspots may get the attention, but for my money this is the kind of music that really brings game worlds to life. Fallout 4 comes out on November 10.